Gallstones have been known to migrate and get impacted in the proximal duodenum or pylorus producing gastric outlet obstruction (GOO). Leon Bouveret, in 1896, was first to report two cases of gastric outlet obstruction due to impacted gallstones.1 Since then, about 300 such cases had been reported in the world literature.2 While the presentation is usually non-specific, the diagnosis can be established by endoscopic and imaging studies in most of the cases.3 We report a case of gallstone impaction in the duodenal wall that posed a unique diagnostic challenge and therapeutic dilemma. The etiopathogenesis and clinical presentations were similar to that of classical Bouveret syndrome but the submucosal location of stone produced deceptive endoscopic and imaging findings. The condition mimicked duodenal neoplasm and resulted in major surgical resection. To the best of our knowledge, this is the first report describing a case of intramural impaction of gallstone causing GOO. A 60-year old lady presented with complaints of recurrent mild upper abdominal pain for the last one year along with multiple episodes of postprandial nausea, non-bilious vomiting since last 2 months with anorexia and significant weight loss. There was neither history of fever, jaundice, gastro-intestinal bleed or dyspeptic symptoms nor any past abdominal surgery. On examination, she was dehydrated, undernourished, afebrile and anicteric. Per-abdominal examination revealed distended stomach with succussion splash and mild tenderness over right hypochondrium. Her laboratory reports including liver function tests were normal. A contrast-enhanced computed tomography (CECT) scan of abdomenshowed a contracted, thick-walled gallbladder with a large stone impacted at its neck, compressing the common bile duct. Gallbladder was abutting the antro-pyloric region, though there was no evidence of cholecysto-duodenal fistula or pneumobilia. Stomach was distended and there was an irregular thickening in the proximal duodenal wall causing luminal narrowing (Figure 1A, 1B). An upper gastrointestinal endoscopy revealed distended stomach and a bulge at the junction of 1st and 2nd part of duodenum (D1-D2 junction) (Figure 1C). The scope couldn’t be passed beyond the lesion. Multiple biopsies were taken from the site of bulge and sent for histopathology. The patient was explored with suspicion of duodenal malignancy. 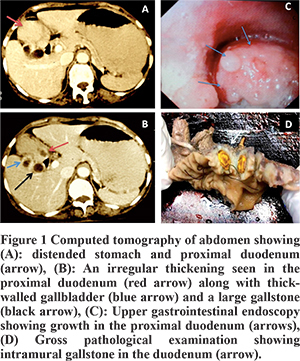 Operative findings revealed distended stomach with thick-walled gallbladder densely adhered to the duodenum. A large solitary stone was found impacted at the gallbladder neck. However, there was no evidence of any fistulous connection between gallbladder and duodenum. A hard mass of 3 X 3 cm size could be palpated in the duodenum, close to the head of pancreas. In view of strong suspicion for duodenal neoplasm, classical Whipple’s pancreatoduodenectomy was performed. Cut section of the resected specimen revealed a 3 X 3 cm ulcerated growth at the D1-D2 junction. The gross pathological examination of the duodenal growth revealed impacted intra-mural gallstone (Figure 1D). On microscopy, there was no evidence of malignancy at the suspected site of growth. The patient had an uneventful recovery and was discharged 10th day post-op. Several cases of classical Bouveret’s syndrome have been published in the medical literature 2, however duodenal intramural gallstone causing GOO has not been reported yet. The submucosal location of stone posed a unique diagnostic challenge in the differential workup of GOO. Below we discuss the broad management of cholecysto-duodenal fistulas with special reference to gallstone migration and impaction in the duodenum leading to GOO. Clinical presentation is non-specific ranging from vomiting (86%) and upper abdominal pain (71%) to hematemesis due to cystic artery or duodenal erosion. Jaundice and abnormal liver function tests are seen in about one-third patients, while a history of previous biliary symptoms in up to two-third of cases.3-5 Our patient presented with complaints of long-standing upper abdominal pain and recurrent non-bilious vomiting with normal liver function tests. Gastroduodenoscopy has both diagnostic and therapeutic value and should be performed in all suspected cases.3 Obstructing stone or fistula may be visualized in most of the cases. However, in our patient, the intramural location of stone limited the role of endoscopy in establishing the diagnosis. The endoscopy picture was suggestive of a growth at D1-D2 junction causing GOO (Figure 1C). Plain abdominal X-ray may show distended stomach, extra-luminal air shadow, pneumobilia or calcified shadow of the stone in the upper abdomen (Rigler’s triad) in about 30% cases.5 Ultrasound may show a contracted gallbladder, cholelithiasis, cholecysto-enteric fistula, pneumobilia and stones in duodenum. However, a distended stomach may mask these findings making it unreliable. Abdominal CT is the single best imaging modality to establish the diagnosis. Findings include distended stomach, impacted stone, oral contrast delineating the fistula tract and pneumobilia. In our case, CT showed cholelithiasis, irregularly thickening of duodenal wall and distended stomach (Figure 1A,B). Gallbladder was abutting the duodenum but features of cholecysto-duodenal fistula (pneumobilia and delineation of gallbladder by oral contrast) were absent. We speculate that evolvingcholecysto-duodenal fistula might have resulted in these atypical findings like the absence of pneumobilia or no noticeable fistulous communication on imaging. This correlated intra-operatively, where the gallbladder was adherent to duodenum, but there was no fistulous connection. The patient was operated with a high index of suspicion of duodenal malignancy Even postoperative cut-section of duodenum revealed mass with ulcerated mucosa at the D1-D2 junction. The correct diagnosis could only be made at final histopathological examination. To conlude, Duodenal intramural gallstone causing GOO is the rarest spectrum of complicated gallstone disease. The condition can masquerade as malignancy and may result in unwarranted major surgery. Bouveret L. Stenose du pylore adherent a la vesicule. Revue Medicale (Paris). 1896;16:1–16. Iancu C, Bodea R, Hajjar NA, Todea-Iancu D, Bala O, Acalovschi I. Bouveret syndrome associated with acute gangrenous cholecystitis. J Gastrointestin Liver Dis. 2008;17(1):87–90. Nuño-Guzmán CM, Marín-Contreras ME, Figueroa-Sánchez M, Corona JL. Gallstone ileus, clinical presentation, diagnostic and treatment approach. World J Gastrointest Surg. 2016;8(1):65-76. Clavien PA, Richon J, Burgan S, Rohner A. Gallstone ileus. Br J Surg. 1990;77:737-742. Brennan GB, Rosenberg RD, Arora S. Bouveret syndrome. Radiographics. 2004;24(4):1171–1175.